I am still laughing, tho. You don't even wanna see those other 12 comments. This is how I prune my Facebook friends. 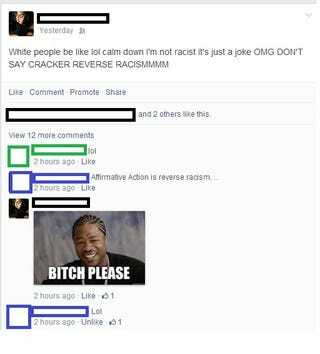 I said, "White people be like lol calm down I'm not racist it's just a joke OMG DON'T SAY CRACKER REVERSE RACISMMMM"
The cool thing is I only had to delete 1 comment.